Grand Hyatt Kauai Resort and Spa is owned and operated by the Grand Hyatt chain of hotels. All rooms and suites at the Kauai Hotel allow guests to choose from one of three views - garden, mountainside, or ocean. Each room and suites also come with its lanai or patio for private views of whatever their choice may be. Rooms come with two different options bed size options, either one king or two queen size beds are available. The rooms are spacious, usually around 500 square feet apiece. There are also five suites available at the Kauai Hotel - Deluxe, Ocean View, Pool, Presidential, and Standard. Each suite comes with different amenities and is roughly two to three times the size of the standard guest rooms. Each room at the Kauai Hotel has a 37-inch flat screen LCD television, a small chiller, bathrobes for use during the stay, an ironing board and iron, a coffee maker, toiletries from Coco Mango, an in-room safe, a hairdryer, and 24 hours in room dining. Rooms either have a walk-in shower or a bathtub with double vanity sinks in the marble bathroom, and a separate seating area. Suites offer the same amenities, but also add additional options. Some of the available amenities in the suites include dining room tables that seat up to six people, whirlpool tubs, larger, 42-inch flat screen LCD televisions, and a wet bar. Some suites (like the Presidential) also have full kitchens. Wireless internet access is provided complimentary to all guests staying at the hotel. Free parking is available to all paying guests. There are two room options that allow for full ADA compliance - one with a king size bed and one with two queen size beds. These rooms have roll-in showers or ADA compliant bathtubs, closed caption televisions, emergency strobe lights on the fire alarms and smoke detectors, a lowered thermostat as well as latches, peepholes, and light switches, grab bars with a raised toilet seat and wider doors. Certain rooms and suites at the Kauai Hotel come with Club Level Access, which allows guests to access the Grand Club. The Grand Club serves a complimentary Continental breakfast buffet as well as hors d'oeuvres in the evening. There are multiple dining options for guests who stay at the Kauai Hotel. One of the uniqueness of the options is a restaurant called Tidepools, where guests will dine in floating bungalows surrounded by a lagoon filled with koi fish. The menu is contemporary Hawaiian, with a focus on local, fresh ingredients and high-quality proteins like steak and freshly caught fish. The restaurant is open for dinner only. For another option, guests can dine at Dondero’s. Dondero’s is designed to look like an Italian villa with floor to ceiling windows. The menu is old world Italian classics. They are closed Sunday and Monday and are only open for dinner. For a luxury nightspot with both drinks and foods, the hotel operates Stevenson’s Sushi and Spirits. Open only in the evenings; the food matches the exquisite decor. The restaurant is adults only in the later evening hours. For a breakfast and lunch open, there is the Ilima Terrace. The restaurant is casual and offers al fresco dining with their breakfast buffet, sandwiches, salads, and other specialty entrees. Hale Nalu provides another option for dining during the morning and afternoon. Serving poolside out of a surf shack, the staff creates burgers, salads, wraps, paninis, smoothies, fish tacos, and more. Another guest favorite is the shaved ice. To go options for breakfast and lunch are available at the Poipu Bay Clubhouse. Hotel guests can grab a yogurt, fruit, cappuccino, and even beer before heading out for the day. There are two bars in the hotel - the Captain’s Bar and the Shipwreck Bar. Both offer mixed drinks, beer, wine, and non-alcoholic beverages until sunset. One other unique dining opportunity at the hotel is their beachside experiences. Guests can order a four-course meal to enjoy on the beach with candlelight, served by a private butler. Located on-site, the Anara Spa allows guests to experience “lokahi,” or the harmony and balance of the spirit with the body. Trained professionals offer massage therapy, facials, and body treatments. Guests receive 24-hour access, seven days a week to the hotel’s fitness center. The equipment is all state of the art - both strength training and cardio - and each machine come with its flat screen television. The staff also teaches fitness classes and provides personal training, on request. 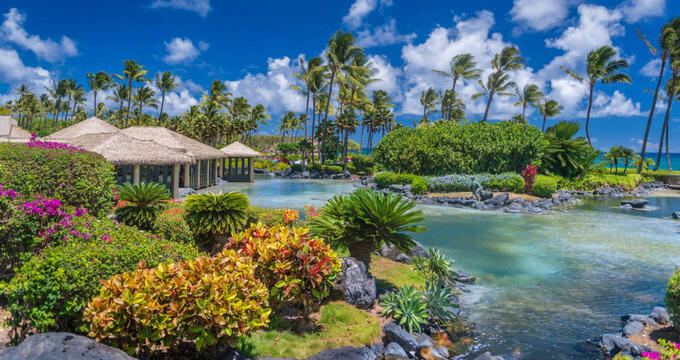 The Kauai Hotel has an outdoor pool on-site that has won multiple landscaping awards. The pool is multi-level and features a lazy river lined with lava rocks, secret caves and seating nooks, and a 150-foot-tall water slide. There are also both water basketball and water volleyball nets. The pool also features an adult only area. It is located right on the white sand beaches of Keoneloa Bay.